This entry was posted on February 25, 2014 by Jessica Anderson. Last weekend I attended my 10-year-old daughter’s basketball game. I am so impressed with our team's two volunteer coaches. Not only do they teach the girls drills, plays, and other skills for the game, but they also show great sportsmanship as humble, calm leaders of the team. Coach Bryce and Coach Michael are outstanding examples of positive parents in youth sports. 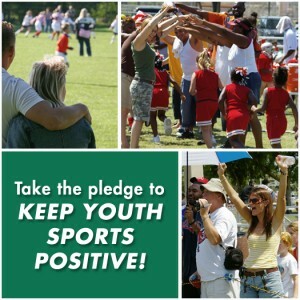 Take the Sports Parent Pledge! The National Alliance for Youth Sports is encouraging parents to be role models for their kids through their Sports Parent Pledge. New series like HBO’s Trophy Kids and Esquire’s Friday Night Tykes bring attention to the roles adults – and especially parents – play in youth sports. And while we do hear about the negative incidences each day in the news, there is a lot of good being done in sports, too, that we don’t hear about. The Sports Parent Pledge gives parents the opportunity to ban together and make a statement that not all sports parents are like what’s depicted on TV and in the news, while also getting a six-part email series packed with useful information and resources they can use to enrich their families youth sports experience. Since Trophies2Go is a sponsor of the National Alliance for Youth Sports, I encourage you to take their pledge, like their Facebook page or share your parent pledge on twitter @NAYS_edu. As engaged, caring and involved parents, let’s take the pledge to keep youth sports positive!